For those of you who have not been there, the Crest Zone of the Mt. Rogers National Recreation Area is likely the most spectacular area in the southeastern United States. 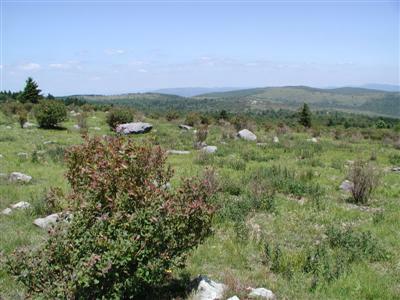 There are rock outcroppings, giant meadows, and seemingly mile after mile of near-timberline country. You just don't see this kind of open terrain in the mountains of the east. Several years ago, Susie and I, and our daughter Erin, were backpacking in the area. We had followed the Appalachian Trail (AT) across Wilburn Ridge as it winds its relocated way through the high country. On our way to the wind-swept expanses of Pine Mountain, we looked over on the particularly clear day, and could see a beautiful open meadow out on Cabin Ridge. Looking at our map, there was not any good way to get to in on a hiker trail, but there were some horse trails in the area, and the country was open. It looked like a great place to camp, and the following year, we made our way over to it. 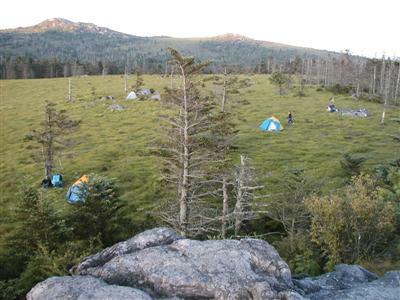 It is a great high elevation camp, with a convenient spring. We have returned many years since, but a couple of years ago, were totally grossed out when the Forest Service, in an unbelievably unthinking act, relocated the horse trail right through the area that was the campsite. We could not believe that the FS had destroyed such a lovely campsite, by building a what looks like a road through the campsite. (Click on this link to view what was done to the campsite.) With a little bit of thinking, they could have moved the trail 50 meters to the south and things would have been fine. If you are concerned about the way horse management is being handled, just go to their web site and click on the mail link. 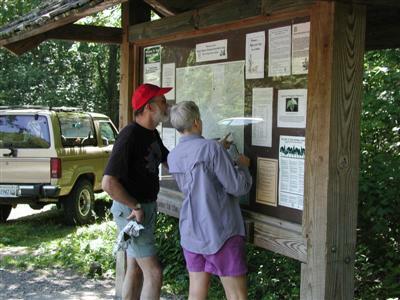 Tell them what you think of their horse trail construction and relocation policy. Anyway, the following year, we just could not bring ourselves to return to that area of the NRA. Instead, we took a near-perfect backpack with a campsite along Pine Mountain. 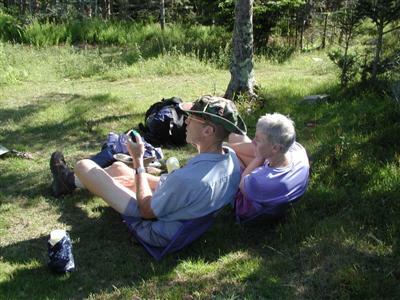 But a couple of years had passed, and we thought we would give the meadow another try, camping in its south western corner, away from the horse trail. So a bunch of us met on a Sierra Club outing in mid-June and headed to southwestern Virginia. Mt. Rogers in NOT close to Knoxville. In fact, it is not close to anywhere, but the trip is worth the gasoline. Seven of us left Knoxville early on Saturday, but only 4 of us showed up at the trailhead. At least initially. So after waiting for nearly a half hour, Susie and I, along with Ron and Barbara, decided to head up the AT. We figured that Will, with Cathy and John in tow, had either had car trouble (unlikely in Will's Volvo wagon) or that they had decided to make a major late breakfast or shopping stop in Damascus. We started at the point where the AT crosses VA 603, and headed "southbound." North and South are fairly abstract concepts on this part of the AT. There is so much winding around that, like many of the highways in the area, you can be hiking in a southerly direction but be headed toward Maine. Ron and Susie were already making tracks in the woods, and as Barbara and I pulled away from the trailhead, we heard a call pull up, and we were betting that was Will. The trail takes some big switchbacks to climb up to the Old Orchard shelter. We all pulled in and in a few minutes, Will, Cathy, and John all showed up. They had, in fact, been goofing off, since they had not noticed that we had passed them on the highway. They thought we were behind them and so were killing time. Oh well, no harm done. Stopping at shelters on the AT is always interesting. You can usually find a journal, with passers-thru writing their impressions. Some of the names that various Through-hikers take on a pretty hilarious. A couple of parties pulled into the shelter area just as we were eating, and it seemed like a big party. One party had completed their hiking for the day (by noontime?) so were spending the night here. John was interested in putting some of his recent GPS training to use (I had done a GPS tutorial outing the previous month) and so we took a waypoint at the edge of the clearing in front of the shelter. We determined, like so many other times, that the trail is not mapped exactly correctly on the topo map. And the shelter was not where it was marked on the map. Of course, one might question: "So what?" If you can see the shelter from where it is marked on the map, the practical impact of it being 50 meters away is pretty minimal. No argument here. Anyway, enough waypoint taking and back to hiking. The trail is pretty good, as it climbs up through the forest. It is a little on the steep side, gaining about 900 feet in a little over a mile. But it goes, and that is the important thing. After about an hour or so of climbing, the trail emerges from the woods out into the Mt. Rogers high country of Pine Mountain. The views are sweeping, but I confess that it felt a bit like the backcountry equivalent of Gand Central Station. Of course, it was a gorgeous Saturday afternoon, and while a quick look over at Rhododendron Gap, nearly 2 miles away, revealed little pink, suggesting that the blooms for which the Gap is named were past their peak, it could hardly be a better day. Barbara even ran into someone from North Carolina who knew one of our hiking buddies from Knoxville. On the crest of Pine Mountain, we left the AT, and headed southwest. Everyone who had not been there before was exclaiming at the views. And those of us who had been there many times were still drinking them in. We opted for the horse trail, which is a bit like an old road along the crest, because it is more out in the open. It was a tad dusty, and it seemed like there were plenty of horse riders, in various states of inebriation. Most of them sober, but some looked like they could fall off their horses any minute. The horse traffic notwithstanding, we made our way along the trail, and noted that there was less water in the Pine Mountain spring than there had been the previous year. We hoped that such would not be indicative of unusually low water in the spring near our campsite. As we hiked up the switchbacks approaching Rhodo Gap, it was clear that the blooms, often perfect this time of year, had peaked probably a couple of weeks previously. One of the problems with having to set outings date 5 or 8 months in advance is that if you are trying to achieve congruence with a seasonally dependent phenomenon, you can wind up getting skunked. But on this gorgeous day, who cared? After a rest to savor the views, we picked up the AT again and began the hike toward Mt. Rogers. We could have taken other trails, but we were ready to relinquish the horse trails to the horses. The key to an efficient approach to this lovely meadow is the willingness to leave the trail and hike cross country. While the terrain is open, the grass can obscure the rough footing and it is easy to twist an ankle or worse. We dropped down to the point of intersection with a horse trail on the NE corner of Cabin Ridge, and headed down to "our" meadow. As we got closer, Susie eyed a lone tent in the area at which we had planned to camp, and expressed major disappointment. I suggested that we drop our packs at the horse-trail compromised campsite, and I would cross the meadow to investigate. I told her that I thought there was a possibility that the tent was that of our friend George. We had asked George to come on the trip, but he had indicated that his plans for the weekend were a bit up in the air, and besides, he wanted to do a different route than we were planning. But he had asked for GPS coordinates of our planned campsite, and my suspicions were confirmed when I inspected the tent. Even though no one was around, and the tent was a ubiquitous Sierra Designs Clip Flashlight, George's water bag, underneath the vestibule, is pretty uncommon, and I knew that it was him. I motioned Susie on over. The rest of the crew, by this time behind us, could see us moving in the right direction, and followed along. Before long, George showed up, having discovered another spring (but not THE spring) that he used to bathe and get water. So we were up to eight. As Ron started to set up his tent, a herd of wild ponies moved in, to see if they could mooch any food. The wild ponies are just one of the many attractions of this place. There is a herd up here, and every year, the herd is culled and some are sold to folks who want ponies, as a way of raising funds to maintain and protect this lovely place. There seems to be decreasing cattle grazing in the area, (thank goodness) and the ponies help to keep these huge balds (for which the Crest Zone is famous), well, bald. Poor Ron could hardly get his tent set up for all of the four legged attention he was getting. We eventually had to chase them away. But they do peak the interest of young kids backpacking with their parents, and it was fun over the years to watch our daughter's eyes light up when she saw some of the ponies. After making a trip over to THE spring (it is about 100 meters back in the woods on the NE corner of the meadow on Cabin Ridge, and has a wonderful pipe in it now), it was time to start thinking about dinner. Susie and I sipped a bit of wine and marveled at the size of the veggie burgers that Cathy and Will were preparing. The evening was so lovely, with the lighting turning to a golden glow. We swore we could even see alpenglow on the peaks of Wilburn Ridge. The evening was cool, but not cold, and it was a great time for baking a chocolate cake on our bakepacker. Unfortunately, the darn thing never got done: we had used cheap food storage bags in which to cook the cake, rather than the more expensive and way-too-large Reynolds baking bags. The cheap bags must have sprung a leak, and allowed steam to enter the cake, and it was even more moist than the advertising claims. So we were forced to eat "runny" cake. What a shame. I had even brought my PDA with a copy of Pocket Stars on it, to help me identify the stars at which we were looking. Since the best way to use this is to lie on the ground and look up, holding the PDA above ones head, I was chided unmercifully about the weird stuff I was up to. Probably with good cause. I don't think I have ever been to Mt Rogers in the summertime when I did not wake up to fog. Even on nights when it is fundamentally clear, it is always foggy in the morning. Could be that the radiational cooling just lowers the temperature to the dew point, and clouds form. Well, anyway, this morning was no exception. The eight of us were locked in our little world, although the fog was not as thick as it has been. When I awoke, you could probably see 100 meters. Downright clear, relatively. Actually, the fog gave a mysterious sense to the spruce forest behind our camp. We had breakfast and packed up our gear. As we did so, we could tell that the fog was lifting. Never a bad thing when the first thing you have to do is hike cross country. Our plan for the day was to head north, sans trail, until we intersected with the AT. We would hike "southbound" on it to Deep Gap. Then, we would leave the AT, and pick up the Mt. Rogers Trail, heading back down to Highway 603. We said goodbye to George, who was parked near Massey Gap in Grayson Highlands State Park, and so was turning to the east, and left the horse trail that crosses the meadow, and headed uphill, avoiding twisted ankles. We hit the AT just east of the Thomas Knob shelter. There we met an actual seasonal Forest Service Ranger who had been in the backcountry for over a week, and was getting ready to hike out. We did not give him a hard time regarding the trail relocation near the other campsite., since we knew he had nothing to do with it. 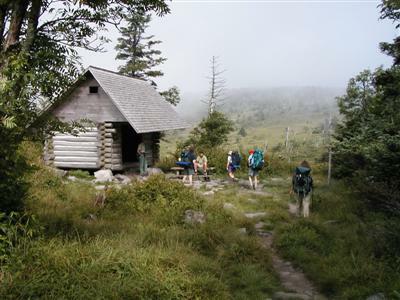 The Thomas Knob shelter was recently written up in Backpacker Magazine as one of the top 10 backcountry privies in the nation. It is in a nice spot, and does have a solar powered fan that helps with waste composting. My own personal preference is the one just downhill from Image Lake in the Glacier Peak Wilderness, that looks over at Glacier Peak itself. But it has been a long time since I had used it and maybe it has been moved. Anyway, Will had to do a thorough inspection of the privy. And I thought I was into defecation. Maybe it is just associated with getting older. The AT slabs around the south side of the Mt Rogers massif. We stopped for a rest break at out last view of the high country, where the trail cuts back into the woods "permanently." You always want to take one more look. From there, the trail crosses a lot of rocks, and is pretty rugged. Everyone gathered at Deep Gap, and decided that we would make the small flat area near the intersection of the Mt. Rogers trail and the Lewis Fork Spur Trail as our targeted lunch stop. As we hiked, I tried to pump Ron, a Finance Professor at the University of Tennessee, for free financial advice, and we had our usually discussions about Macs vs PCs. I was the last one to pull into the lunch stop ( I am usually the last person to pull into any stop). Everyone else seemed to have been lounging for some time. Lunch was simple crackers and cheese. We never have figured out a good second day lunch (like a sandwich) that does not require refrigeration. At the end of lunch, Susie and I were discussing our drive home, and I casually mentioned that we should easily get home by 6 pm. Since Susie hates getting back home after a weekend backpack that late, her compulsion to do all of the "Sunday" chores (like laundry, etc) before hitting the sack on Sunday night, I could feel her energy level rise, and her pace quicken as we pulled out of the lunch stop. She confessed to being interested in getting home sooner, rather than later, and it was really hard for everyone to keep up with her. (Note that it is a fairly long drive back to our home in West Knoxville, something like 3 hours or so.) She gently suggested that maybe the thing to do would be for me and Will to jog back the 1 3/4 miles or so to our cars (this is an open ended loop trip). I thought she was nuts, but I could tell by her body language that she was as serious as a heart attack. Besides, she said, you have not had any really good cardiovascular exercise today. As I got to the end of the trail, after having done what seemed like an interminable series of long switchbacks, I crossed the highway and dumped my pack. I put on my camp shoes (old running shoes) and started to lace them up. Susie asked me what I was doing. I told her that I was jogging down to the car (fortunately it was slightly downhill). She said, "Oh, I was just joking!" I smiled at her and said, "Yeah, right. I'll be back in a few minutes." I took off at the kind of speed one might expect from an ordinarily slow jogger who has just hiked several miles with a 60 lb pound on their back. It was not more than a few minutes that Will, who had finished hiking a minute or two after I had, caught up to me. We went slow enough to chat, and remarked that it did not look like many of the folks out driving on the road were as "into" exercise as we were. Maybe the great trip had just energized us. For a few more photos of the trip, you might go to the "executive summary" or this trip posted on the HBG Sierra Club Web site. For another look at the Mt. 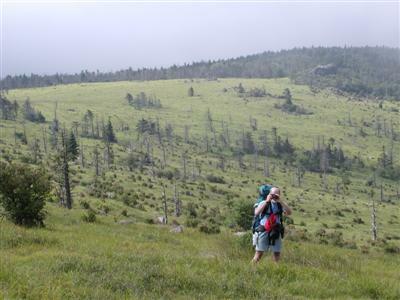 Rogers High Country, go to Snuffy's web page on section hiking the AT.